Baby J received a beautiful blue Betta fish for his first birthday. "Buddy the Betta" quickly became an important addition to our family. I was amazed at how well my one-year-old accepted responsibility for the fish. He reminds me every morning that we need to feed "Buh" by pointing to him. I place a few flakes of the smelly fish food in the bowl and we watch together as Buddy eats it. Little J giggles and smacks his mouth in immitation. When we go away on longer trips, I let my son place in one of the less smelly fish-shaped feeding tablets, which he really enjoys. When we clean Buddy's bowl each week, J likes to follow me back and forth to the sink, pointing and jabbering the entire time like he is overseeing matters. When we are finished, my son likes to close the lid by himself. We have been working on closing it "gently," and he is coming along quite swimmingly with this request. 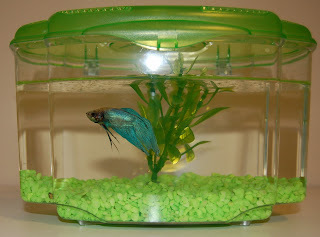 My son's first pet was also a Betta! He was 2 when we got it and named him Curious George! We even had the bright green tank you have! We upgraded him to a larger vase and he seems to like it much better. There are some plants in there that he can hide in (and he is a good hider). My son still enjoys watching George swim around and likes watching me change the water as well! I like the big vase idea. I am definitely considering an upgrade for dear Buddy now.